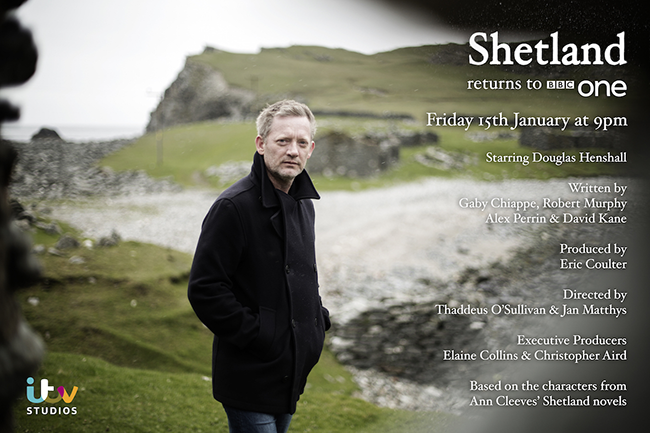 The new series of Shetland, based on Ann Cleeves' award-winning Shetland novels, starts Friday 15 January 2015 on BBC1. Watch the trailer now. The new series of Shetland starts on Friday on BBC1 at 9pm. The television drama based on Ann Cleeves' award-winning Shetland novels. When a young man disappears on the ferry crossing from Aberdeen to Shetland, and a small boy ends up in intensive care, DI Jimmy Perez and his team become convinced the two events are connected. Douglas Henshall returns as DI Jimmy Perez, aided by Tosh (Alison O'Donnell) and Sandy (Shetlander Steven Robertson). Check back in next week as we have an exclusive interview with Jimmy Perez, a.k.a. Douglas Henshall. Look out for Too Good To Be True, a gripping Quick Read from Ann Cleeves, featuring Detective Inspector Jimmy Perez from the bestselling Shetland series. Out 4 February 2016.